Globe Telecom is stepping up its campaign versus text spams by making it easier for its customers to report such annoying messages. The move is part of the telecommunication provider's most aggressive initiative so far to address proliferation of spam and scam messages. "We are paving the easiest way possible for our customers to report text spams in line with the company's efforts to eliminate unwanted and unsolicited promotional text messages that many of our customers complain about. We believe that partnering with our customers in this endeavor would render our campaign more effective," Globe Senior Vice President for Corporate Communications Yoly Crisanto said. Crisanto emphasized Globe will continue to pursue its commitment in going after companies that engage in marketing activities thru text spamming. "The recent filing of complaint against two companies that persistently make use of text spamming as a marketing tool is just an example of the extent we will go to address the issue," she stressed. Spam messages are usually sent by prepaid numbers as they are untraceable and are easily disposable. Spammers also don't need to specific numbers to send spam messages to as they make use of USB GSM modems and they spam number ranges. Legitimate text blasts approved by the regulating agency are properly identified and do not carry 11-digit numbers. 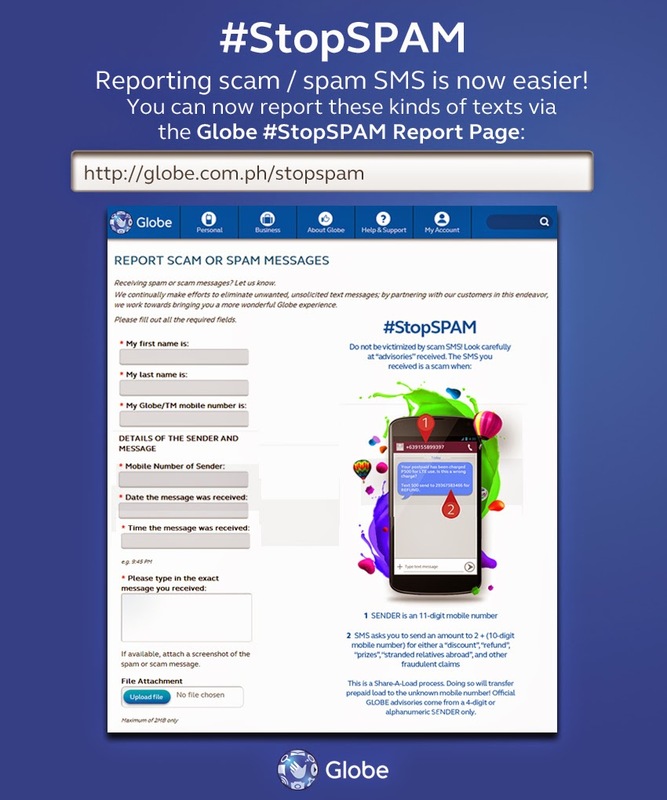 Aside from the Globe channels, customers can also keep themselves from getting text spams through their own devices. iOS users may block unwanted numbers by opening the message, clicking the Contact button at the right hand corner, clicking the "i" next to the number they wish to block. They can then scroll down to the bottom of the page where they will see the option "Block this caller" and then click to confirm. For Android users, subscribers may block spam through their gadget's filtering settings: Go to Settings, press the Spam Message Settings, click "Add to Spam Numbers" and add spammers' numbers. They may also choose to actively block by inputting commonly used spam phrases and adding it to the "Add to Spam Phrases" list.